Violet writes letters for a sick mother and befriends her curious daughter Anne. 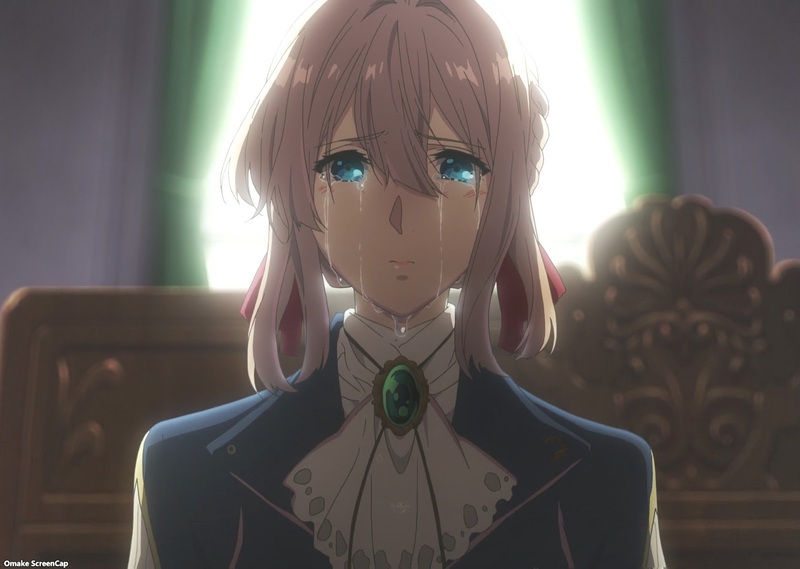 Episode 10 - "Loved Ones Will Always Watch Over You"
Damn you, KyoAni! Why are you so good at making little girls cry and making the audience cry with them? The plot here is pretty straightforward. Dying mother wants to write letters for her daughter for when she's gone. The little girl Anne isn't stupid, but she hasn't yet consciously confronted her fears that her mother will soon be leaving her, and this manifests as strong separation anxiety. She even articulated it as hating guests because it takes her mother's time away from her. As always, what's important to the series is how Violet reacts to this assignment. The little girl Anne believes, for almost the entire week that Violet is working for her mother, that she is an actual doll. This is a good device to focus the audience on Violet's innate laconic nature, to worry about where this vignette is in relation to when she found Gilbert's grave, and to see what character development has happened in the meantime. It's not until the end of the episode that we find out that Violet has been going through a long grieving period, this assignment was her first traveling one in quite a while, and that she has fully become empathetic to other people's feelings. The scene which illustrates this best is when Anne feels Violet's cheek at her departure and realizes she's a warm real person instead of a talking doll. At this point in Violet's development, she is a warm real person who can cry for a little girl who will be losing her mother. Cattleya comforted her with the title of this episode, that "loved ones will always watch over you." Does this mean that Violet has accepted Gilbert's death? That she's already moved on, or is moving on, since she's working again? We're only given tantalizing hints, but at the very least, we know that Claudia's company survived for at least 14 years to deliver birthday letters to Anne Magnolia. I can only wonder what has happened to Violet in the meantime. So much story to tell, that there's no opening sequence or closing credit sequence. This is another episode that fits more closely to how the light novel chapters are written. Violet is a really big doll! Oh, that kind of Doll (Auto Memoranda Doll). This is sad. There's lots of good foreshadowing about the poor little girl living by herself in a mansion that will be too big for her. Violet has the parasol from the playwright, so this is happening at least after she walked on water. Anne can too use big words! I believe you! Har. Anne's not wrong about Violet never playing with dolls before and always being the one played with. It's a nice reminder of where Violet has come from as a tool of war. She's learning, Anne, she's learning. Oho. This poor girl is already asking the right questions, "Why must nothing in life go right?" Cattleya would say this, "Staying up late is a lady's worst enemy." Aw. Anne knows her mother is dying and that she'll be left alone soon. No wonder she's desperate to spend so much time with her and hates guests taking that time away. Aw. They're birthday letters. Damn you, KyoAni. Making people cry on purpose. Anne Magnolia. Another flower name. I wonder how long after this is happening from when Violet saw Gilbert's grave. It looks like she's slowly getting ready to move on and accept the passing of time and the passing of loved ones.